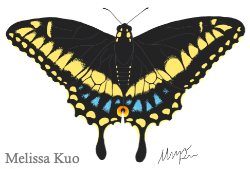 Added 1/20/2019: Black swallowtail, Papilio polyxenes. 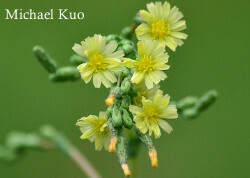 Added 12/23/2018: Illinois bundleflower, Desmanthus illinoensis. 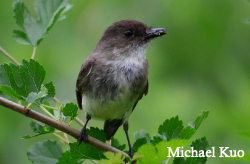 Added 12/20/2018: Eastern phoebe, Sayornis phoebe. 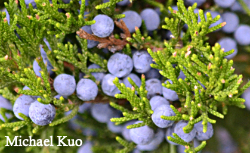 Added 11/25/2018: Eastern redcedar, Juniperus virginiana. Added 11/17/2018: Wolf's milk slime mold, Lycogala epidendrum. 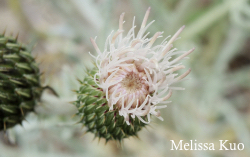 Added 7/31/2018: Dune thistle, Cirsium pitcheri. 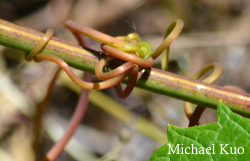 Added 7/19/2018: Riverbank grape, Vitis riparia. 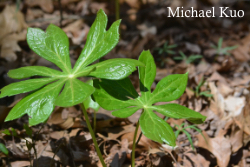 Added 5/1/2018: Mayapple, Podophyllum peltatum. Added 5/1/2018: Mayapple rust, Allodus podophylli. 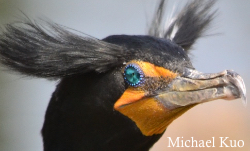 Added 4/21/2018: Double-crested cormorant, Phalacrocorax auritus. 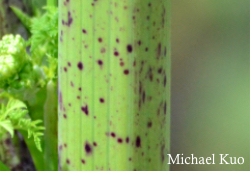 Added 4/17/2018: Poison hemlock, Conium maculatum. 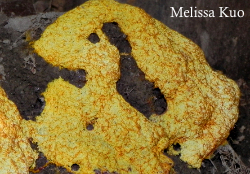 Added 4/13/2018: Dog vomit slime mold, Fuligo septica. Added 12/20/2017: Common sowthistle, Sonchus oleraceus. Added 12/20/2017: Prickly sowthistle, Sonchus asper. Added 10/20/2017: Rough-leaved dogwood, Cornus drummondii. Added 10/8/2017: Painted turtle, Chrysemys picta. Added 9/25/2017: Jack-in-the-pulpit, Arisaema triphyllum. Added 9/18/2017: Tar spot of maple, Rhytisma americanum, is a harmless parasite. Added 9/18/2017: Red maple, Acer rubrum, displays red in every season. Added 9/18/2017: Silver maple, Acer saccharinum, has distinctive leaves. Added 9/9/2017: The monarch butterfly, Danaus plexippus, is a Midwestern icon. Added 9/9/2017: Common milkweed, Asclepias syriaca hosts diverse insects. Added 8/23/2017: The American robin, Turdus migratorius, has an unfortunate scientific name. Added 8/22/2017: Pokeweed, Phytolacca americana, makes amazing berries in late summer. Added 8/12/2017: The wood duck, Aix sponsa, is an unmistakeable bird. Added 7/21/2017: The brown-headed cowbird, Molothrus ater, lays its eggs in the nests of other birds! Added 7/21/2017: Eastern cottonwood, Populus deltoides, is a towering riparian tree. Added 7/20/2017: The widow skimmer, Libellula luctuosa, is a common sight near water. Added 7/19/2017: Butterfly milkweed, Asclepias tuberosa, has deep orange flowers. Added 7/19/2017: Dogbane, Apocynum cannabinum, is common throughout the Midwest. Pictured above are the flowers of Asclepias tuberosa, known as "butterfly weed" or "butterfly milkweed." As its common names suggest, it is a favorite of monarchs and other butterflies, appearing in summer throughout the Midwest. It is easily identified by its gorgeous orange flowers and its alternating, narrowly oblong, pointed leaves. 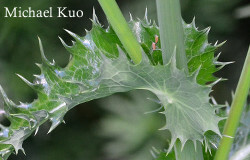 Midwestnaturalist.com is the creation of Michael and Melissa Kuo, and our son, Will. We are not biologists (Michael is an English teacher, and Melissa is a banker), and we're definitely not professional photographers—but we love learning about the outdoors. If you have a question or a comment, please feel free to contact us at . The Midwest is large and diverse, containing many different ecosystems. We are based in central Illinois, where the corn and soybean fields stretch to the horizons and the woods (primarily oak-hickory and cottonwood-sycamore forests) follow rivers and un-tillable land. In the northern Midwest, however, ecosystems range from beech-maple woods to cedar swamps and sub-boreal forests (among others), while in the southern Midwest one can find southern forest ecosystems and, in Kentucky and southern Ohio, Appalachian ecosystems, famous for their natural diversity. That's a lot to cover—but we love to travel, explore, and learn! The information at our site is based on our own observations, with reference to an ever-growing collection of online and printed source material (see our references page) that we rely on for help with identifications and context. Edibility and toxicity are not a primary focus for us; we think nature is much more engaging, important, and interesting than figuring out what happens to humans when they pass its organisms through their digestive systems. We will mention toxicity when it is reported by our sources, and edibility when we have actually tried eating whatever it is, but you should definitely consult a different source if your interests are culinary. You are welcome to use our images for non-commercial purposes without asking for permission, provided you credit our work diligently. For commercial use of our images (including digital and print publications, and slides for paid lectures) please contact us. Our site is designed for home computers using standard Internet browsers. We have tried to make navigation and layout fairly simple, so that our material can be browsed on phones and tablets, but our pages will look better on home computers. If you'd like to donate, we'd appreciate your help supporting this site! Contact—Please feel free to contact us at .